It may have been a resources thing. I removed a few elements and scenes and I *think* it has stopped. Well, nevermind. Removed a bunch of resources and it seems to still be doing it. I'm gonna keep trying things, but it's really annoying. Anyone else see this before? twitch.tv/thegamersdome if you want to see it in action since I am live now. Same thing happens to Me. Did you find a solution yet? I also have an Elgato. Uninstalling the software and trying again. I am running AMD for a video card and processor so it might be a software issue. Ill post back. Scott Gerhardt Did these blinks start randomly? Could the blinking have began when you added the delay to your stream? Gregory Muir Are you using a video delay as well? Also, what Elgato card are you using? No delay, I was familiar with your wirecast software and noticed you made GameShow so I thought I would give it a shot. So all the settings would be default minus what I set for resolutions. I notice the issue of blinking was worse with multiple monitors vs one monitor in the video previews. I was actually having issues trying to capture my screen or game just on my pc with the Game Show software. I wasn't using my elgato. I uninstalled the elgato software just incase it was causing issues with Game Show somehow. No delay that I am aware of considering I was just using gameshow via my pc and not my elgato. I didn't set the delay. The flickering looks like its related to frame rate in some manner. I even tried reinstalling the game show software. Nothing. Check out the Advanced Preferences section in Gameshow. See if using the Legacy D3D9 readback will fix the issue. If you remove the Video Delay from the Elgato source, do you see the issue then? Same thing happens to me weekly, for a year now - haven't heard any fixes...can someone,....SOMEONE fix this? Good grief. Pauperganda Please update to Gameshow 4.5 and test. Considering the discussion stopped two years ago the issue was likely fixed. There's been no new reports here for two years. CraigS This started 1 year back. I don't have the funds to keep re-purchasing software...is there a patch or something? Pauperganda The upgrade to 4.5 should be free. In fact you should keep Automatically check for updates enabled in preference unless you check frequently on your own. Updates include fixes. Issues should always be based on the current version as they are the fixes for previous versions. They are the patch. Not sure what happened, but now I have a watermark of GAMESHOW over any shot...how do I get rid of this? I purchased it already and don't want to see this. Pauperganda Go to GameShow Preferences > Licenses and make sure you're serial number is activated (serial number is visible and says "Deactivate" next to it). Otherwise you may need to Activate again. CraigS Activate again? I've purchased it already...is this what you mean? If so, it's kinda shady making folks buy software twice to fix a glitch. I shouldn't be penalized for bugs...I just want that blink to go away. Pauperganda Activate just enter the serial number you already have. Please follow my instructions. CraigS I updated, then I get this...what should be my next step? I think it worked, I recorded a few min and didn't see the flash - I so hope this is over with, thanks for the support! Pauperganda Good to hear it's working. It's not - after all that, the flicker is worse than ever now...here's the link: https://www.twitch.tv/videos/324750264 Really frustrating. Pauperganda I watched for a minute or so it seems fine. Perhaps you can tell me where specifically. Happens often at top of show above, viewer also mentioned this timecode as a flicker area: 3:07:50. Pauperganda Thanks for pointing it out. Intermittent and apparently random black frames. 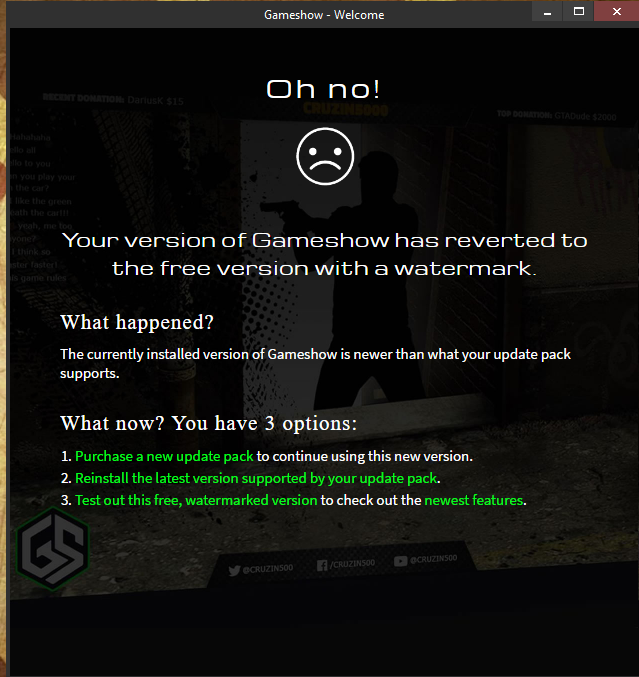 Try reseting GameShow Preferences and starting with a new document. GameShow > Help > Send Support Information but click on the lower left button Reset Preferences. I've been through sending specs/new doc 3 times now...that's not it.